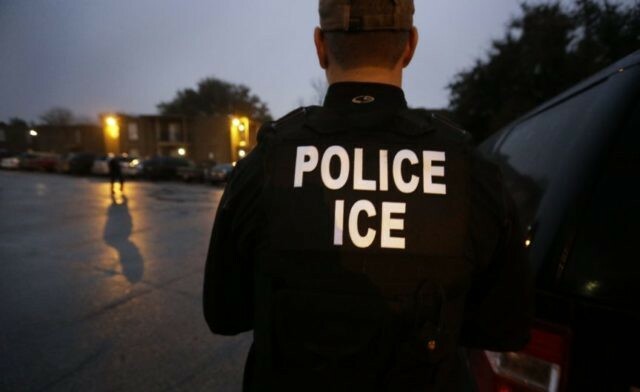 President Donald Trump lauded the work of ICE (U.S. Immigration and Customs Enforcement), pledging Tuesday evening in West Virginia that the U.S. will not abandon ICE as Democrats want to do. “We want border security. We want security in our country. We respect ICE,” Trump told the Salute to Service event crowd in White Sulphur Springs. “These are tough people,” the President said of ICE law enforcement. He pointed to the vicious transnational criminal gang MS-13 and others who are illegally in the U.S. because of weak immigration laws. “These guys, they walk into those areas. they take them outta there so fast. They’re not afraid of anything,” said Trump. “Then I hear Democrats saying ‘we wanna abandon ICE,’” said Trump. “We’re not abandoning ICE. And we’re not abandoning our law enforcement. Just the opposite,” Trump pledged. Democrats and leftist activists have been calling for ICE to be abolished. Fear-inducing messages at weekend protests included urging to vote out Republicans and to abolish ICE.